Play video Super Bowl 50: Who should you support?Super Bowl 50: Who should you support? Play video Super Bowl 50: Who should you support? And with that news from Bristol comes the end of another week of Sportsday live. You've got one job now - go and enjoy your weekend. Maybe some cricket for starters, football for the main course and Six Nations for dessert. Six players have signed new contracts at Championship leaders Bristol which will keep them at the club until 2017. 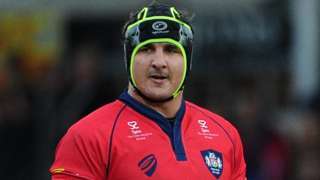 Winger Charlie Amesbury, locks Glen Townson, Joe Joyce and Mark Sorenson, full-back Auguy Slowik and fly-half Charlie Sheedy have agreed new deals. Bristol sit top of the Championship table, having won 12 of their 14 games. "These six players have played an important role for us over the past few seasons," director of rugby Andy Robinson told the club website. Six players sign new contracts at Championship leaders Bristol which will keep them at the club until 2017. The following day, Northern Ireland will travel to their base camp in France to complete their preparations. Michael O'Neill's side will play Poland in their first group game in Nice on 12 June. Here's a nice, quirky tale for you - courtesy of our friends at the Newcastle Chronicle. It centres on a Brazilian football fan who fulfilled his dream this week when he travelled across the world to watch his beloved Blyth Spartans play. The team rewarded his commitment with a 2-1 win over Salford. Scenes. Ever wondered why some commentators seem to have a vast amount of knowledge at their fingertips? Well, even if you haven't, the reason is the type of pre-match notes BBC Newcastle's Nick Barnes gets together before a match. Paris Saint-Germain midfielder Thiago Motta wants to stay in the French capital until his playing days are over. "If I can finish here, so much the better," Motta told AFP. "It's difficult to imagine moving now, even if from one year to another things can change. "I have decided to stay in Paris and I'm happy with that. PSG is my home and I feel important here." Juventus defender Martin Caceres is out for the rest of the season with an Achilles tendon injury. Caceres picked up the injury during Juventus' 13th straight league victory, a 1-0 win at Genoa on Wednesday. Caceres, 28, is out of contract at the end of the season. As expected Guus Hiddink expressed concern about the financial clout of Chinese football. He revealed he's spoken with people within the game in China and expressed a desire for them to develop football in the right way, to bring in experienced coaches and set up academies and not to just throw money at the top players. He also said China are serious about getting into international football. He was reluctant to talk about Manchester United and their problems and wouldn't really be drawn on his fellow Dutchman Louis van Gaal, "we have a professional relationship". Chelsea v Manchester United commentary is on BBC Radio 5 live on Sunday. Watford boss Quique Sanchez Flores believes some of the best strikers in the Premier League will be on the pitch at White Hart Lane tomorrow as his side take on Tottenham. Odion Ighalo and Troy Deeney have excelled this season as has Harry Kane for Spurs. “Kane is a very good player," said Flores. "He is very important to them. Tottenham play a lot in the middle but if you don’t have a good striker it’s impossible to end the product. He is one of the best strikers in the league. League Two rivals Carlisle United and Yeovil Town have been fined by the Football Association for failing to 'ensure their players conducted themselves in an orderly fashion'. The charge related to a brawl in the 78th minute of Carlisle's FA Cup third-round replay victory on 19 January. Current NBA champions the Golden State Warriors visited the White House to meet the president - something all NBA champions get to do. The Golden State Warriors not only won the NBA title last June - they also carried on where they left off by winning the first 24 games of this season when they reconvened in November - a record start to a season. Barack Obama, of course, is a Chicago Bulls fan and got to know GB star Luol Deng when he was playing with the Bulls. Players from League Two rivals Mansfield Town and Yeovil Town have taken an unconventional approach to their injury rehabilitation. 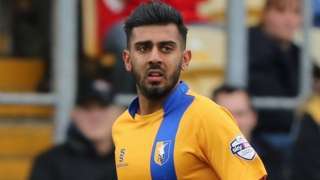 Stags defender Mal Benning has revealed he was so keen to make a swift return from a cruciate knee ligament injury, he tested it by tackling a brick wall. Meanwhile, Yeovil keeper Artur Krysiak, 26, was sent to swim in the sea because an ice bath was unavailable. "I just put a ball against the wall and smashed the ball as hard as I could," Benning told BBC Radio Nottingham. "It was just against the wall to make sure my knee got used to it. "I had three months of doing leg weights but my knee wasn't used to that movement, so I needed to get that back. Even when I started running I still had twinges in it. "I have got in my routine now after two weeks of training. It's great to be back." Players from League Two rivals Mansfield and Yeovil take unconventional approaches to injury rehabilitation. "Manchester United boss Louis van Gaal says Luke Shaw could play in the Europa League final, if they make it that far. The Dutchman says it is possible the England full-back could return from a broken leg before the end of the season, so he has named him in his squad for the competition to give him a goal to work towards." The Football Supporters' Federation has released the following statement following an apparent meeting of top flight clubs on Thursday. “We are incredibly disappointed to learn that a proposed cap on away ticket prices was voted down by the Premier League clubs yesterday in a secret ballot. Supporters will not let them off the hook," said the FSF statement. “Football supporters are right to be angry about the Premier League clubs’ apparent reluctance to tackle the problem of ticket prices. Top-flight clubs have known since last year that they will be receiving a huge increase in their TV revenues. "In the light of that windfall, Premier League clubs cannot justify maintaining high ticket prices, particularly for away fans. “Despite clubs failing to agree a way forward yesterday, this issue will not go away and fans will continue to fight for fair ticket prices. "We understand that the Premier League will be working with clubs over the coming weeks to find a way forward. That must result in meaningful action on away prices at the next shareholders' meeting at the end of March. If clubs have the will to do this there must be a way." Newcastle head coach Steve McClaren has defended the club's decision not to recruit defenders in January as he faces a fresh injury crisis. McClaren will be without a specialist left-back and is down to his last two central defenders for this weekend's crucial clash with West Brom. "We could never have foreseen it," said McClaren. "We had four fit ones (central defenders) all training before the window closed, so no, there's no criticism there." Watford defender Miguel Britos is expected to return to the team for tomorrow’s Premier League match at Tottenham. Britos was ill on Wednesday and missed the 1-1 draw against Chelsea. Midfielder Etienne Capoue was also ill during that match but he too should be fine for the trip to White Hart Lane. Tottenham are in fine form in the league but for Flores it makes no difference: “We don’t think about the level of the opponent. We just analyse the team. We put it in the computer try to focus on how they play. “For me it’s not too much important whether they are at the top, at the bottom or in the middle because finally eleven players, one style of player, we review, we try to play football. "Tottenham is difficult, the stadium for sure will be a tough atmosphere but I think the players of Watford know they are able to do anything." Liam Hunt: Watched Pompey in the 2010 cup final from a darkand dingy bar in some LA suburb. Will never make the mistake of May hols again. Thomas M. Curtis: Once watched Manchester derby with an American in a village on the west coast of New Zealand. On the only TV in the village. Stoke are in negotiations over a new deal with forward Marko Arnautovic. The 26-year-old Austria international is reported to have a buy-out clause in his contract that means he could leave the club for £12.5m this summer. Arnautovic signed a four-year deal with the club when he joined them in the summer of 2013 and it is understood the clause becomes active in the final 12 months of the agreement. "Every contract is different. From my point of view, I want Marko here and he's best served here," said Stoke boss Mark Hughes. "He has the opportunity to evolve here. He's progressed in two years, he's an intelligent boy and he knows what we can give him." Ronald Koeman has drawn a line under his midweek tunnel bust-up with Arsene Wenger. The Southampton boss and Arsenal chief exchanged words following the goalless draw at Emirates Stadium on Tuesday night. Wenger had reportedly shouted at referee Lee Mason "It's always the same with you" with Koeman responding to the Frenchman: "No, it's always the same with you." Koeman confirmed the incident had taken place as it was reported, but insisted it was all in the heat of the moment and that it would not affect his relationship with Wenger.